Learn more about American flamingos with the Photo Ark! This flock of American flamingos is sunning itself on the Río Lagartos in northern Yucatán, Mexico. We’re going to have to update our map! What is the species range of the American flamingo? 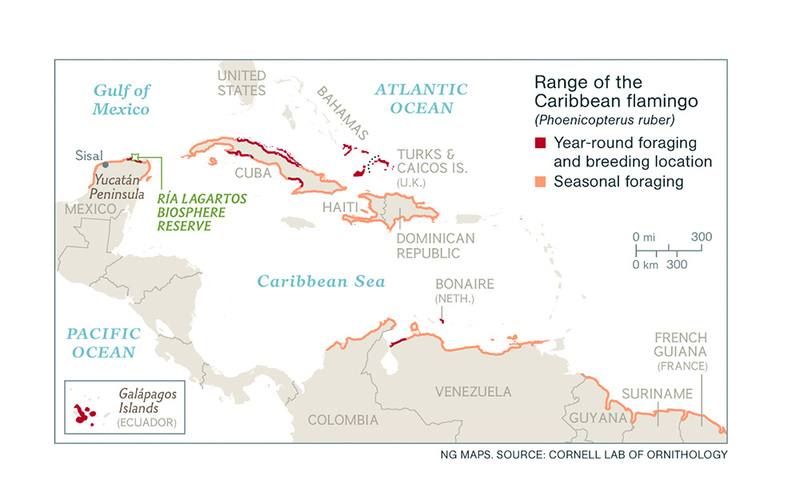 Until recently, the species range of the American flamingo was thought to be mostly in the countries of the Caribbean—hence the bird’s other name, the Caribbean flamingo. Healthy populations can be found along the coastlines of Cuba, Hispaniola, Turks and Caicos, Bahamas, the Yucatan Peninsula, and the northern shores of South America. 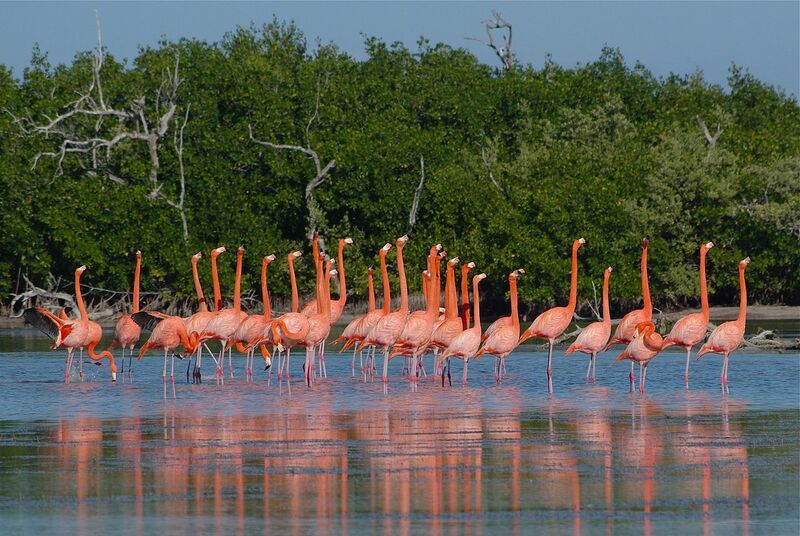 We now know populations of flamingos are probably native to southern Florida as well! If ornithologists didn’t think flamingos were native to Florida, how did they explain the enormous flocks reported by naturalists of the 17th, 18th, and 19th centuries? Some of those early naturalists did think the birds were year-round residents. Native or transient, why did flamingo populations plummet in the late 19th century? feathers. That gorgeous pink plumage was used in hats and fans throughout the late 19th and 20th centuries. food. Flamingos meat used to be available at specialty markets in the U.S. This isn’t new: The ancient Romans served flamingo as a delicacy. Flamingo meat is still available (if not popular) places such as Iraq and India, and the birds have been hunted as an emergency food source in Venezuela. Populations of American flamingos have recovered. In fact, they are evaluated as a species of “least concern.” Is it legal to hunt them? No. Flamingos are protected by the U.S. Migratory Bird Act of 1918. If experts thought flamingos were not native to Florida, how did they explain the individual birds (and sometimes entire flocks) that consistently appeared in the Sunshine State as their population recovered? How did scientists determine that Florida’s flamingos are native species after all? field notes from ornithologists and hunters (including John James Audubon, who was both). These notes included dates, sizes of the flocks encountered, the presence of juveniles, and notes about the birds from the local population. GPS. Meet Conchy, the first and (so far) only flamingo ever tagged in the U.S. After showing up at the Key West Naval Air Station in 2015, Conchy was taken to Zoo Miami and later released. His tracking device revealed Conchy stayed in Florida Bay for two years, showing the region can support a flamingo population. How did citizen scientists contribute to the discovery of Florida’s homegrown flamingos?